On the “commons” section of Wikipedia, I found this marvelous photo of these perfectly formed (mandalas) dew drops on a spider web. They float there like little water planets reflecting nature’s green and blue background. Certain times of the year, we here in Oregon see this quite often. It feels very mystical and magical. 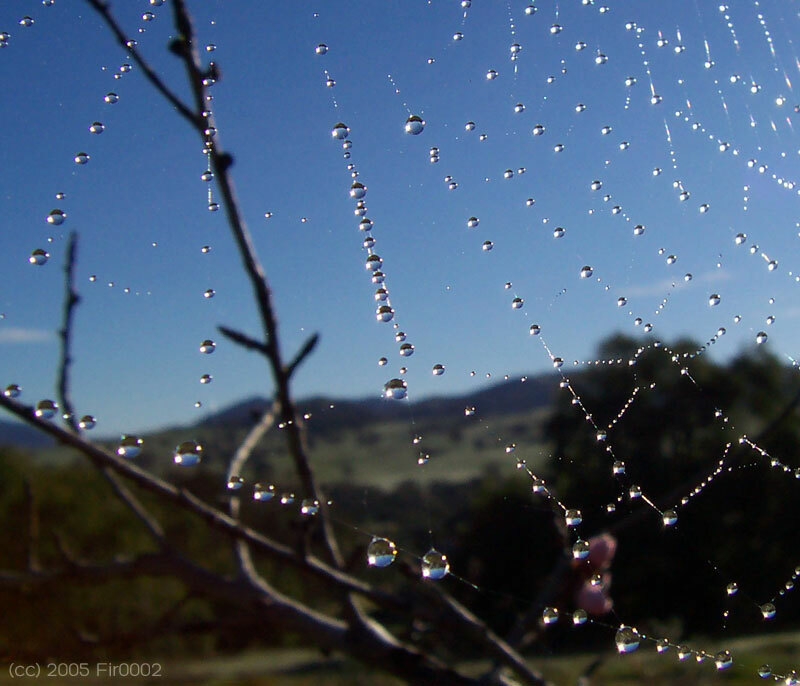 That being said, researchers Lei Jiang from the Beijing National Laboratory for Molecular Sciences and his colleagues did a study to find out how/why spider webs collect water and published their findings in Nature magazine in 2010. They noticed that as water condenses on the web, droplets move towards the nearest spindle-knot, where they coalesce to form larger drops. While our left (logical) brains can appreciate and understand the science of dew drops on spider webs, it serves us well to also engage our creative (right) brains in the mystical magical wonder of nature.